After the successful outcome of their first festival, just one month ago, the unstoppable NJ Proghouse ‘staph’ have not been resting on their laurels, and have continued in their commendable mission of providing a showcase for the best progressive music at the local, national and international level. With an impressive series of shows already planned for the next few months (and some more yet to be confirmed) the group of passionate music fans based in New Jersey’s Raritan Valley have turned into a force to be reckoned with – especially now that they can count on the quaint yet welcoming premises of Dunellen’s Roxy and Dukes Roadhouse as a regular venue. In a spur-of-the-moment decision, I decided to head north from my Northern Virginia home (though this time on my own) to attend the highly awaited debut of Shadow Circus at the NJ Proghouse, which also coincided with their very first outing with their new lineup. I had last seen the band one year ago at the Orion Studios, in the aftermath of Hurricane Sandy and a few weeks before the official release of their critically acclaimed third album, On a Dark and Stormy Night – a show that had been plagued by a number of technical issues and had seen a less than stellar turnout. Unexpected lineup changes had prevented the band from performing again for quite a long time, in spite of the album’s positive reception. Understandably, this show right on their home turf was of paramount importance for the band led by guitarist John Fontana and vocalist David Bobick. For the occasion, they had teamed up with another local band, Edensong (who had performed at ProgDay 2009) – a very interesting pairing, seen as the two outfits’ approach to progressive rock is at the same time similar and different. It felt oddly comforting to be back at Roxy and Dukes after a month that, for me, had been fraught with stressful events. The low-ceilinged, dimly lit interior of the venue, with its endearingly kitschy décor, looked much roomier with the tables arranged in groups of two or three rather than in long rows, making it easier for people to move around. The turnout was not too bad for a late Sunday afternoon, and there were quite a few familiar faces among the audience. Indeed, the Proghouse ‘staph’, together with the Roxy and Dukes staff, have created a warm, friendly ambiance for both performers and attendees, so that every show feels like a house party that invites people to linger rather than depart abruptly when the music is over. 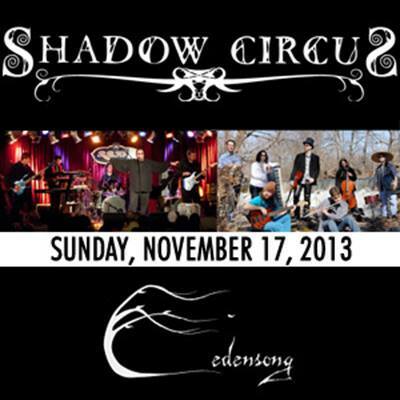 Shadow Circus had been announced as performing their latest album in its entirety – which turned out to not to be strictly true, as the lovely, ethereal “Ixchel” was omitted for technical reasons (i.e. the lack of a female backup vocalist). However, the album’s overall impact was not lessened in the least, and the band’s two newest members – bassist Chris Valentine and drummer Campbell Youngblood-Petersen – looked perfectly at ease, projecting enthusiasm and self-confidence as well as showing considerable skill with their respective instruments. Decked in black as usual – with only keyboardist David Silver’s snazzy jacket’s bright red lapels adding a touch of colour – Shadow Circus delivered an energetic performance, deploying all the theatrical flair of their material and their trademark blend of classic symphonic prog and hard rock, powerful yet melodic and accessible. John Fontana – looking highly concentrated and just a bit tense – cranked out riffs and blistering solos on his trusty blue axe, while Silver’s impassive mien belied the exuberance of his Emerson-inspired keyboard runs (and that in spite of a few technical glitches). Sporting a purple-dyed beard and round mirrored shades, his microphone decorated with a large silver cross in pure Black Sabbath style, David Bobick handled his master-of-ceremonies duties with consummate ease. He introduced the album’s back story as soon as he appeared on stage at the end of the grandiose instrumental “Overture”, then put his theatrical training to good use while belting out the songs with gusto. The band wrapped up their set with one of their undisputed crowd-pleasers, “Willoughby”, which got the audience to sing along to the infectious chorus. Originally formed in 2002 by guitarist/composer James Byron Schoen when attending Wesleyan University in Connecticut, Edensong have been through a myriad of lineup changes before and after the release of their full-length debut, The Fruit Fallen (2008), which included songs dating back from the early days of the band. Though not exactly prolific, they are very eclectic in their approach, blending classic prog with a host of other influences ranging from Cat Stevens and Simon and Garfunkel to modern progressive metal. This eclecticism was amply displayed on the Roxy and Dukes stage, where Edensong proved that they are not just a heavier version of Jethro Tull (as some have labeled them). Obviously, the prominent role of the flute – used as a lead instrument as much as the guitar or the keyboards – will elicit comparisons with Ian Anderson’s crew, but Edensong’s music also possesses a keen contemporary edge and an intriguingly dark, mysterious vibe. Though I was somewhat tired when they got on stage, I could not help admiring the dramatic intensity of their sound (albeit with a strong undercurrent of melody) and their impressive stage presence. The youthful quintet’s bohemian appearance, which reminded me a bit of The Tea Club, intensified the music’s emotional impact. Bare-chested flutist Barry Seroff very physical approach to his instrument matched the engaging antics of bassist TD Towers (a dead ringer for a young Ian Anderson, clothes included), and keyboardist Stefan Paolini drew the eye with his bright red pants. Drummer Tony Waldman kept up with Towers’ unflagging energy, while James Byron Schoen himself, though more sedate in demeanor, cut a striking figure with his red beard, jaunty hat and Steven Wilson-like bare feet. While his voice may be a bit of an acquired taste, I found it fit the music really well, and his edgy yet melodic guitar playing was not at all affected by this double duty. The band performed a selection of songs from The Fruit Fallen and their 2010 EP Echoes of Edensong, plus three songs (“Cold City”, “Years in the Garden of Years” and “In the Longest of Days”) from their forthcoming new album, which will be based on the concept of time. As usual, attendance could have been higher, especially considering that the show ended no later than 9.15 p.m. Unfortunately, it seems that any band who does not feature attractive young women or members of prog’s old guard will have to be content with drawing no more than 50 people. On the other hand, it was heartening to see two bands sharing the stage on equal footing (no headliners and openers, and the same time allotted to both) and obviously admiring and supporting each other’s work. This was my fourth time seeing Shadow Circus perform live, and I am glad to say that the band has grown both in self-assurance and musical stature. As for Edensong, I will be looking forward to their new album, and hope to see them again on stage soon. On the whole, the evening was definitely worth the trip, and my only regret is that Roxy and Dukes is not closer to our home.